From the moment I opened the cover of “In Memory of Greed,” I knew I was in trouble. Eradicated were thoughts of cramming for my final exam. And it wasn’t merely because it began in Kenya, on the Masai Mara game reserve, even though I can hardly wait to make a dream trip to South Africa in July. The story pulled me into its clutches, and it wouldn’t let go. Boudreau’s writing grabs you by the collar and refuses to let go. International intrigue sweeps the reader across continents from one sensational juncture to the next. Well developed, riveting characters lead the way, fighting through each gripping scene that will have you hanging on the edge of your seat. Political corruption driven by greed and increasingly dynamic power plays don’t leave you a moment to catch your breath. 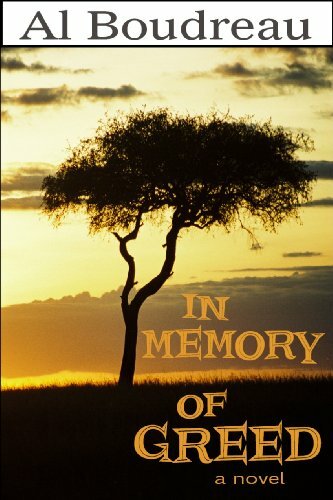 In Memory Of Greed delves into the human spirit, illustrating how a person can dig down deep to find the strength they need to continue and to face adversity head on and bare their teeth at it in defiance. This novel is an outstanding showcase of Al Boudreau’s talents. Don’t miss this thrilling adventure, experience it for yourself!